She just loves the present, though it cost me only $2, a napkin and a bit of my time and creativity. – First I painted both of these with the white paint. I let it dry up well. – I cut out the napkin pattern for the decoupage. I have to admit that I made a mistake here. First I applied some polish to the board and made it sticky and only then decided to try, how the napkin would fit the board! It’s a messy thing to do. So, don’t do it. First try you pattern on and only then apply the polish. – So, I applied some transparent polish very sparingly and glued the napkin on it. If you apply too much polish right away, the napkin would go bubbling. Once it gets stuck well to the board, apply more polish to it and let it dry. – I made an inscription with the crocheting hook. I just dip it into the golden paint and write with it. The word says Easter in Russian. – I took a dish washing sponge, dipped it into some golden paint and patted the board with it. And, let it dry. This is essential. 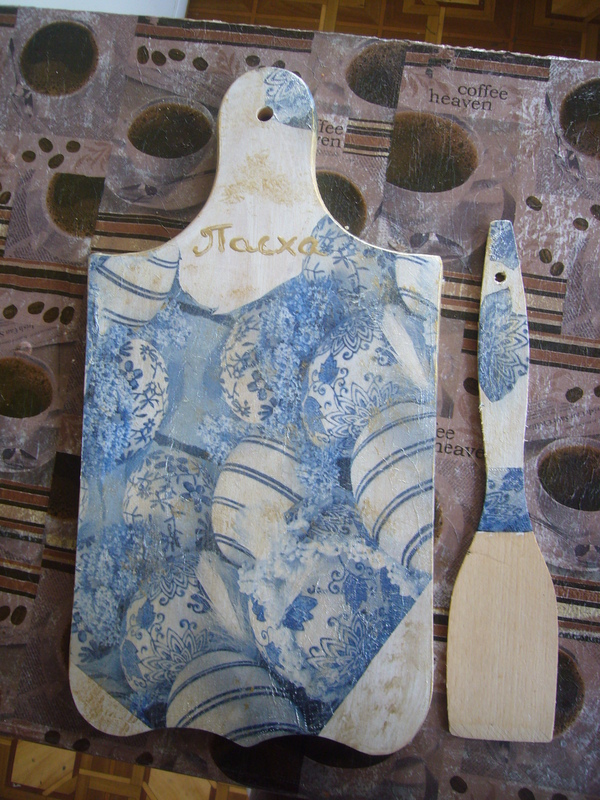 If you touch wet decoupage polish, you risk to have both the napkin and even paint come off the board or bottle. – Finally, I covered up the board with the polish well and let it dry. So, that’s my Easter present wood deoupage how to. I have done the same with the shovel. I have deocupaged only one side of the board. This way my friend would be able to use it for cutting her bread and hand it on the wall to decorate her kitchen, when she doesn’t. This entry was posted in Uncategorized and tagged crafts, decoupage, decoupage how to, decoupage ideas, decoupage step by step, decoupage tips, easter, easter decoupage, handmade Easter present, wood decoupage. Bookmark the permalink.